Jim Corbett National Park is the oldest National park in India, which was established in the year 1936, to protect the endangered Bengal Tiger. This was also the first to come under the Project Tiger in 1973. Most famous denizens of this forest are Asiatic elephant and the Bengal tiger. The elephants are known for their remarkable intelligence and a sharp memory. They have the largest brain in the animal kingdom. They are social animals and live in groups. The group comprises females and their young ones and is led by the eldest and the most experienced female. The adult males after a certain age usually move alone and associate with the group during the mating season. 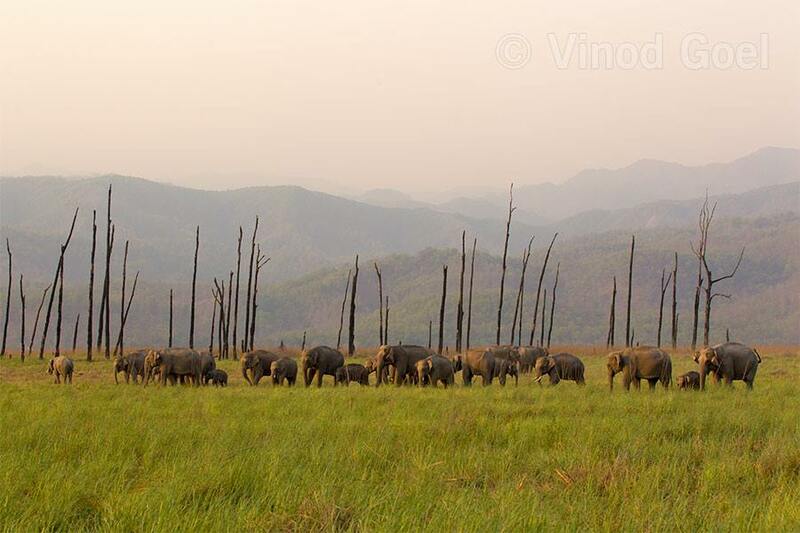 As per the latest census this park has more than one thousand elephants comprising male, female and the young ones. Although they are distributed in all the ranges but the best place where they are present in maximum number is Dhikala Chaur. In fact Dhikala Chaur is the favourite haunt of elephants as well as spotted deer, hog deer and the charasmatic Bengal tiger. I remember that in the month of May 2012, (Best time to observe elephants), I was just interested in shooting the majestic elephants during 10 safaris. Even then I was lucky to have glimpses of the Bengal tiger during 6 safaris. Elephant herd at Dhikala Chaur.